Green Hill Zone as it appears in Smash. Green Hill Zone (グリーンヒルゾーン, Green Hill Zone) is the stage that represents Sonic the Hedgehog in Super Smash Bros. Brawl, Super Smash Bros. for Nintendo 3DS and Super Smash Bros. Ultimate. It is unlocked after Sonic himself is unlocked. In Brawl and Ultimate, Sonic is fought for his unlocking battle. The stage consists in a single piece of land with a bridge on its left, walk-offs at both sides and a depression in the middle. The ground of the middle part is susceptible to attacks, and chunks of it crumble away if they sustain enough damage, transforming the center of the stage into a pit. The broken parts regenerate over time: players below it when this happens will fall through it. Occasionally, checkpoint lampposts randomly spring up. They are normally blue, but when attacked they turn red and start spinning: in this state they are able to hurt players other than the original attacker. They only deal 10% damage, but cause decent knockback with KO capabilities. After a few seconds, spinning lampposts stop and can be attacked again. They disappear on their own after a while. The background features a giant shuttle loop with a 1-Up monitor above it. Occasionally, Tails, Knuckles and Silver run along it. In Super Smash Bros. for Nintendo 3DS, the Ω form is a flat version of the normal form's ground that has the checkpoints and walk-offs removed. The stage also extends below the blast line. In Super Smash Bros. Ultimate, the main platform of the Ω form and Battlefield form is similar to the Ω form in SSB4; however, it does not extend below the blast line and is resized and reshaped to match Final Destination and Battlefield, respectively. The three soft platforms of the Battlefield form are reminiscent of the grassy checkered soil of the ground and are unique to this form. 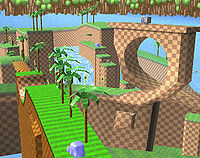 Green Hill Zone, as it originally appeared in Sonic the Hedgehog. This stage originates from the eponymous level in the first Sonic the Hedgehog game; it later appeared as an Easter egg in Sonic Adventure 2, its first 3D appearance, and as the opening stage of Sonic Generations. It is depicted as a lush paradise, with many plants and a peculiar checkered ground design. Some parts of the ground, often located at the edge of cliffs, crumble when stepped on. 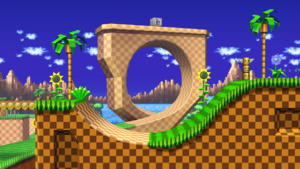 Shuttle loops, which have to be ran through by building up enough speed, first appeared in Green Hill Zone, and became a prominent feature in later Sonic games. Item Boxes are another recurring element in Sonic games: they display a picture depicting the item they contain. If the image is Sonic's head, they grant the player an extra life. Throughout Sonic the Hedgehog, lampposts act as checkpoints and are activated when Sonic runs past them. Upon activation, the blue orb on their top turns red and makes the orb spin for a short time. The characters which appear in the loop are: Miles "Tails" Prower, Sonic's friend who first appeared in Sonic the Hedgehog 2; Knuckles the Echidna, Sonic's rival who made his debut in Sonic the Hedgehog 3; and Silver the Hedgehog, who debuted in Sonic the Hedgehog (2006). On March 17th 2009, the BBR announced that the stage should be banned, as opposed to its former status as a counterpick, and the stage has since been universally banned in tournament play. Many players take issue with Green Hill Zone for its extremely campy nature: the most effective strategy when fighting here is to camp the signposts, which have a centralising effect due to their significant defensive power for an already highly defensive game, can severely elongate the flow of the match. Another major issue with the stage is its deep slope design, which, besides being awkward to fight on, can create a cave of life effect since players can DI and tech into the ground. Furthermore, both sides of the stage have permanent walk-off edges, favoring chain throws or simply camping the edge; the frequent absence of a lower blast-line also negates any off-stage play. Green Hill Zone in Brawl. (From right to left) Tails, Silver and Knuckles running in the background. 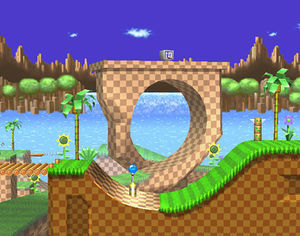 Green Hill Zone in Super Smash Bros. for Nintendo 3DS. Captain Falcon and Sonic on Green Hill Zone in SSB3DS. Villager caught by the Arcade Bunny's claw on the stage in Ultimate. Knuckles posing on the stage. Bowser, Pikachu, Robin, and Sonic on the stage in Ultimate. The error on the DOJO. When playing as Pokémon Trainer, they will stand on top of the loop. Due to the bridge being destructible and able to be affected by hitstun, the bridge will sometimes slow down attacks like Spin Dash or Wario Bike. This is rather ironic considering that, in the Sonic series, a player would ordinarily use the Spin Dash in an area with this stage's layout in order to quickly accelerate to max speed and jump high into the air. A mistake currently exists in the Spanish and United Kingdom versions of the DOJO!! of this stage's page: instead of displaying the Sonic universe icon, Sonic's head's silhouette, it has the symbol of the Mario universe, which is a mushroom. Green Hill Zone is the only stage in Brawl to have only one original remixed song. The musical selection for Green Hill Zone in Brawl makes a subtle reference towards Sega in the first letters of each track that ends in "Zone": Scrap Brain Zone, Emerald Hill Zone, Green Hill Zone and Angel Island Zone. Green Hill Zone appears as a stage in Sonic Battle, Sonic the Fighters (under the title "South Island"), and in Dengeki Bunko Fighting Climax. This makes it one of six stages in the Super Smash Bros. series to be featured as a stage in other fighting games, the others being the Fountain of Dreams, Pyrosphere, Suzaku Castle, Midgar, and Dracula's Castle. In All-Star Mode in Super Smash Bros. for Nintendo 3DS, checkpoint lampposts do not appear on the stage. In Ultimate, Sonic is the only character who travels to Green Hill Zone in his Classic Mode route. This page was last edited on April 16, 2019, at 15:59.